Avatar has wonderful crimpy, dense, and fine fleece, but what truly separates him from the other outstanding herd sires is his phenomenal handle - due only in part to the exceptional uniformity of his fleece. Fineness: 15 out of 15 ; Handle: 5 out of 5 ; Uniformity of micron: 7 out of 8 ; Crimp: 8.5 out of 10 ; Density: 3 out of 5 ; Brightness: 8 out of 10 ; Lack of medullation: 8 out of 10. (Scores are given without regard to color). Avatar's Stars (kids) had accumulated 41 Championships & 75 Blue Ribbons as of early 2011 - in full fleece halter & in fleece shows. Avatar has well over 120 cria on the ground and counting. 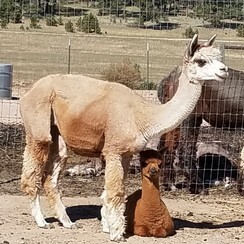 His offspring's most recent accomplishments include Delphi's Lailah: Color Champion Grey Female at the 2012 Nationals - with her Juvenile fleece; Delphi's Rama: Blue Ribbon at the 2012 National Fleece Show, and brown Color Champion at the Tenessee Waltz Fleece Show. These two Avatar kids helped Delphi win the 2012 Classic Cup for fleece at the 2012 Nationals! And oh my you should see this year's crop of new babies. Avatar has given Delphi 2 rose grey sons that look to be boys we are likely to keep forever. Plus a full sister to Lailah, and a gorgeous crimpy brown son named Tau. Watch for these babies in the 2013 Show Ring! 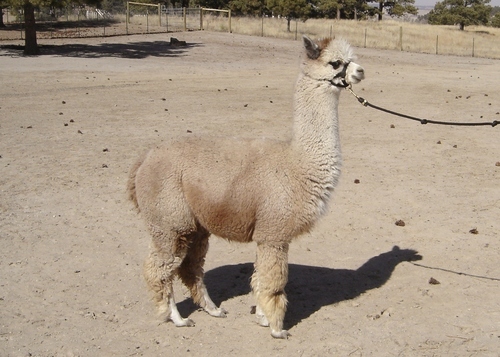 Avatar's many crias include Futurity and AOBA National Show Champions, several National Fleece Champions, and numerous Multi-Champion and Blue Ribbon show winners. More Champions continue to arrive every year. Previously closed to outside breedings, you may now purchase breedings to Avatar for your best girls! Right now we are making a special offering for a breeding you may choose to use now in Pennsylvania, or bank to use anytime during the next 18 months, at any of Avatar's locations. 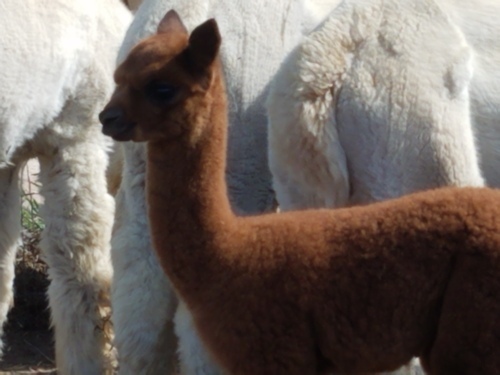 Imagine how excited you will be to meet your very own Avatar cria! We only recently added Antonia to our sales list as we seriously approach retirement. One of the first cria born at La Mancha, Antonia is a lovely light, lavender shade of rose grey. She has placed in every halter class she entered and is always a star in spin-offs. In 2011, one spin-off judge gave her full points for crimp and architecture and commented on the ease of carding her fiber and the softness of the yarn produced. 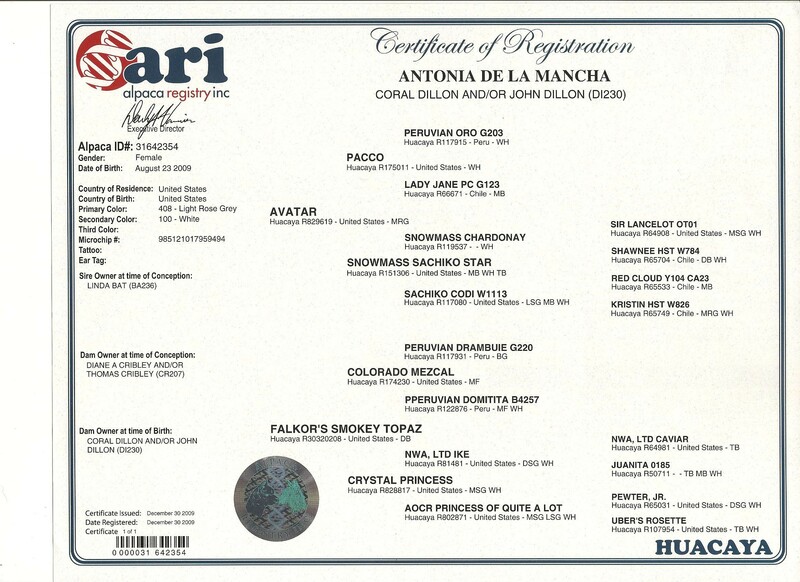 She was awarded a Blue Ribbon in the 2013 CABA Classic spin-off! Some of the comments made by the spin-off judge included: nice handle; easy to spin; really liked this yarn, especially color; nice luster. The total score was 90 out of 100 possible points. The judges last comment was "This fleece made a nice lofty yarn--would also dye beautifully." The past few years, her fleece has been sold to hand spinners at marketing events. We are so very proud of Antonia. She is a wonderful girl and a great mom! Her first born was a dark male, registered as Medium Brown but his grey genetics are very evident. 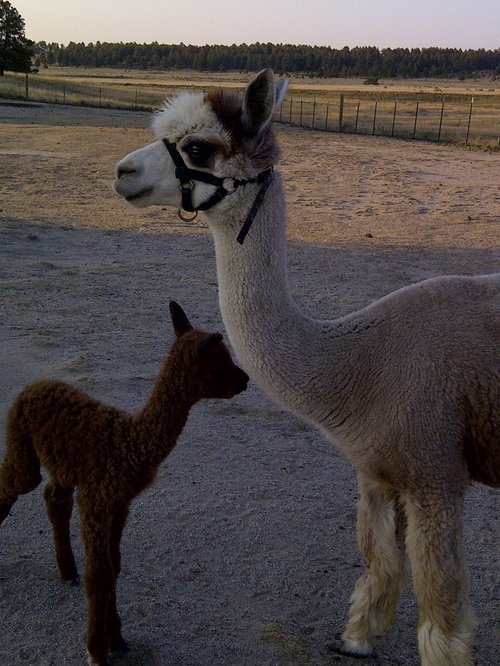 Her second cria was a Modern Dark Silver Grey male. His cria fleece took a blue ribbon in the Alpaca Fleece Show at the 2015 National Western Stock Show. Antonia next added an outstanding male, sired by Autumn Sun's Apache Longbow, a Snowmass Enlightenment son. This boy is sold but sure to be a winner! He sheared True Black but now those grey genetics are sneaking in. The new owners are excited about his potential. This newest little girl has beautiful fleece with a wonderful hand. She seems perfectly balanced in every way! She appears light brown at this time but we all know we should not jump to conclusions, especially with her strong grey genetics! She has black points and maybe a touch of grey on her ears.